Moussaka is a really delicious Greek casserole. It's usually made with potatoes, but if you leave those out and use some more eggplant, it becomes a lovely low carb casserole. In stead of the usual bechamel sauce I topped it off with some home made almond cream. The subtle almond taste really gives this dish something special. This recipe may look like a lot of work because of all the steps involved, but once you get started it actually comes together pretty smoothly. You may not want to make this after a long day at the office, but on a lazy Saturday night it's very doable. Just remember to soak the almonds and salt the eggplant in advance. Cut the eggplant into 1/2 cm (1/4 inch) thick lengthwise slices. Sprinkle the eggplant slices liberally with salt and put them in a colander. Let them sit for half an hour or more so the salt can draw the moisture out of the eggplant. Rinse the eggplant under the tap to remove the salt. Make a pile of rinsed eggplant slices and squeeze them gently to remove excess water. Preheat the oven to 200 degrees C or 400 F. Cover a large baking tray with parchment paper and put the eggplant slices on it. Brush or rub the olive oil onto the eggplant (silicone cooking brushes are great here). Put the tray into the oven and bake the eggplant for about 10 minutes until it's golden brown. Let the eggplant cool. In the mean time you can make the tomato sauce and the almond cream. Put the tvp granulate and the soy sauce into a small pot and add water until tvp is just covered. Bring it to a boil, cover with a lid and cook for about five minutes until the tvp is soft and the water has been absorbed. Remove the lid for the last minute or so to evaporate excess water. Preheat the oil in a larger pot and sauté the pepper and reconstituted tvp. Add the other ingredients and bring the mixture to a boil. Turn down the heat a little and let the sauce simmer for about 10 minutes. Put all the ingredients for the almond cream into the bowl of you food processor or high speed blender and puree into a smooth sauce. Depending on the strength of your machine, this may take a few minutes. 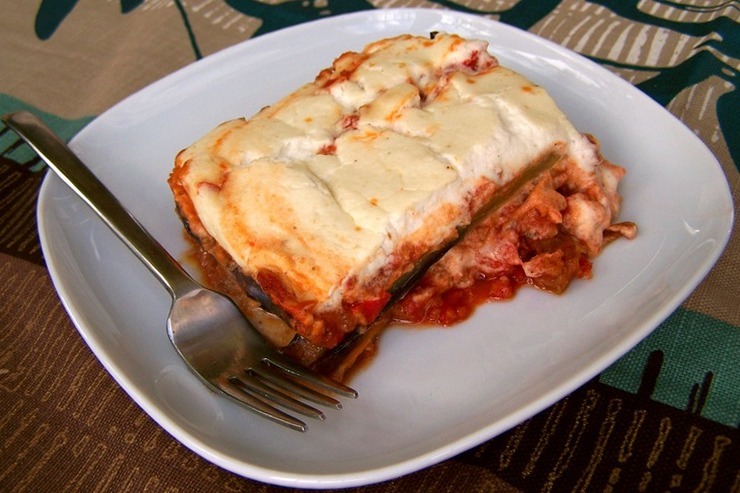 Take a smallish casserole dish and fill it with layers of tomato sauce and eggplant. Finish with tomato sauce and top it off with a layer of almond cream. Put the casserole into the oven and bake for 25 to 30 minutes at 200 C/400 F.
One serving (1/3 of this recipe) has about 480 kcal, 26 g fat (3 g saturated), 26 g net carbohydrate, 20 g fiber and 22 g protein. Thanks! I would love to hear what you think if you decide to make this. Maybe it's good to be aware that the soy sauce contains soy and usually gluten. So it's not automatically gluten/soy free if you follow the recipe. It looks very good though!